Michael Vaughan became the eighth celebrity to leave Strictly Come Dancing as he and partner Natalie Lowe lost the dance-off to Nicky Byrne and Karen Hauer. Michael was attempting to survive his third dance-off but it was a tough task as Nicky and Karen were on a different level. Micahel upped his performance in the dance-off but it wasn’t enough to sway the judges. Craig Revel Horwood, Darcey Bussell, Bruno Tonioli and Len Goodman all voted to keep Nicky Byrne and Karen Hauer. It was the right result for Nicky Byrne and partner Karen Hauer as the danced the Argentine Tango. Karen stole the show for me in her stunning and revealing dress. 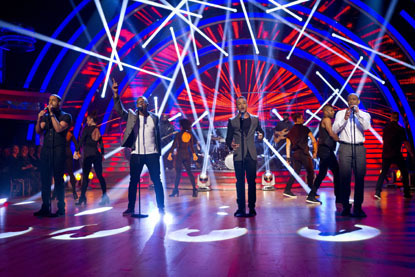 JLS were on the show, performing their latest single. Shows they just don’t stick to X-Factor. 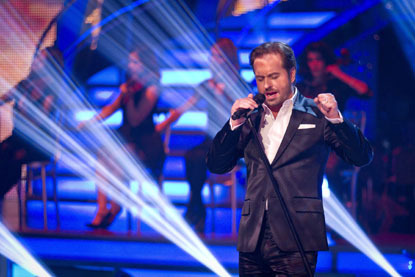 We were also treated to a performance by singing sensation Alfie Boe as he sang “Bridge Over Troubled Waters” from his latest album. In the live show we had been treated to an acrobatic performance from Louis Smith and Flavia Cacace who topped the leaderboard with a 37 which included 10’s from Darcey and Bruno. Louis is starting to perform and act the dances rather than just do the steps. Hope he can continue this. Louis, Denise, Dani and Kimberley are certain to make the semi-final. Lisa and Nicky will have to battle it out for the the remaining place. Next week it’s dance fusion; the couples dance two different dance styles in one performance. Should be interesting. It’s certainly new for Strictly.